Open UI is a new thing in Siebel CRM. Siebel Open UI is browser independent Siebel application with enhanced look and feel, advanced features and many more. To know more about Siebel Open UI, please read our Open UI training series or watch our YouTube videos. Here we will discuss how to apply Open UI patch on Siebel Sample/Local database to ready our developer environment. 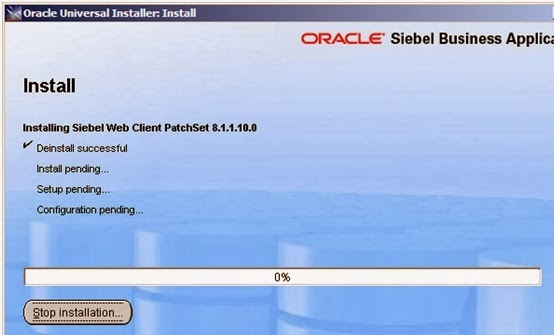 If you already have Siebel 8.0/8.1 base version installed in your system, then you are good enough to apply Open UI patch on it. Otherwise, upgrade your Siebel base version first to 8.0/8.1 and then apply patch. Here we will apply Open UI patch 8.1.1.10 on Siebel base version 8.1.1.0. If you don’t have the patch handy, you can download it from oracle website. Inside the patch folder, there will be two subfolders, one for Siebel_Tools and another one for Siebel_Web_Client. You open any one of these two folders to apply patch. Here I have picked up Siebel_Web_Client folder to do this. Now, click on the file ‘Module’ under the path ClientSiebel_Web_ClientDisk1install and follow below steps to complete the process. Step 1: Specify the WebClient path where you want to apply patch, then browse the path and click next. If you like to get updates from Oracle support web or want to be informed of any security issue, then provide your email id in the next window. If not, just keep it blank. Click on ‘Install’ button and go to Step 2. Step 2: Once you click on the install button, wizard will start installation automatically. During installation, oracle creates a log file for the same.You can find it under the path Oracle InventorylogsinstallActions*.log. Step 3: Once the patch is installed successfully, wizard will be auto closed. Now open your installed Siebel Tools folder location and locate the new folder called ‘REPATCH’. Inside that folder, you can see many folders with various options. As we are applying patch 8.1.1.10, unzip the zip file OpenUI_Base_81110. Inside the unzip folder, there will be one file called ‘Read me.txt’. You can refer this file for remaining steps to complete the process. Otherwise perform below steps to run your application on Siebel Open UI mode. Our next target is, import all open ui related sif files into siebel repository. There is one Siebel provided bat file import.bat which will import all sif files using the file preference.txt. If you want to import individual package one by one, then go to the specific package folder and follow steps given in readme.txt file. As we want to import all files, use the main import.bat file under the folder Tools_1REPPATCHOpenUI_Base_81110OpenUI_Base_81110. 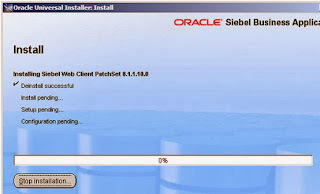 Step 4: There are few optional steps before starting import like backup of Siebel database, create new ODBC connection. For safer side, we will make a copy of our database. Also if you want, change the symbolic string prefix. To change it, open tools.cfg file and locate the parameter SymStrPrefix. You can put any string in the place of X_. Oracle suggests to give SBL_ in the place of X_ so that we can get to know what all objects have been imported after applying open ui patch. Step 5: Now if you want to import sif files related to Oracle BIP Reports, create a new project other wise no need to create any project, just lock below projects before importing files. Step 6: Open language.txt file under the path Tools_1REPPATCHOpenUI_Base_81110OpenUI_Base_81110 and ensure that your preferred language code is present in that file. Step 7: Now we will configure the file preference.txt which provides the parameter details to import.bat. This step is optional, if you keep any parameter blank and click on import.bat file, then it will ask for parameter values on run time. We would suggest to populate preference.txt file properly first with all parameter values and then click on the import.bat file. Below are the parameters what all we need to populate. Once you are done with the file setup, click on the import.bat file. If there is anything wrong in parameter setting, Siebel will throw error. Fix those and run it once again. After clicking on the import.bat file, it will ask you ‘Start import (y/n)?’. Choose option ‘y’ and press enter, then select option 1 to import all. Step 8: Once the process is completed, do a full compile to get a new srf. Put the srf in Webclientobjects folder. Now open any client cfg file (like uagent.cfg, sales.cfg) and add below parameters under the section ‘InfraUIFramework’. That’s all. If you want, you can change the symbolic string prefix parameter(SymStrPrefix) value back to x_ in tools.cfg .Now our Siebel Open UI application is ready, clear browser cache and open Siebel Open UI application. If IE is your default browser but want to open it in other browser like Firefox or Google Chrome, then perform few more additional steps. Here we will tell you, how you can open the application in Firefox. Same is applicable for other browsers as well. Right click on the ‘Siebel Client’ icon and click on properties. Now your siebel open ui application will open in Firefox browser.If you face any challenge during applying Siebel Open UI patch, feel free to ask us. To get more updates, follow ‘TechOneStop‘ on Facebook/Twitter/LinkedIn or add yourself as follower.